There are a lot of little things that make Logan Lucky as charming as it is. There is the effortless style of it. The breezy way in which director Steven Soderbergh (welcome back, sir) movies from one scene to the next despite the film involving a rather complicated script via new talent and/or what is a pseudonym for Soderbergh's wife Jules Asner or Soderbergh himself in Rebecca Blunt. There is also the ensemble cast of recognizable faces and charismatic personalities that make each and every one of the many plights that each and every one of these characters encounter that much more amusing. And then, and then there is the simple and just subtle enough techniques that deal in the filmmaking side of things that Soderbergh utilizes to make this feel simultaneously as raw as some of the emotional wounds these characters are dealing with while being as authentic as the general air of authenticity that surrounds each of these people. Whether it be in the shooting style that includes these movements or tracks that don't feel overly polished, but are seemingly intentional or the way in which Soderbergh, who serves not only as the director (and possible writer), but the cinematographer and editor here as well, cuts his scenes together to emphasize certain jokes or moments-it all feels rather perfectly imperfect. Bring all of these elements together and what we have is essentially a southern fried heist film from the guy who made all three of the kinetic and flashing Ocean's movies. It has been a decade since Ocean's Thirteen and it's not difficult to see why this genre is as attractive as it is as it offers the always appreciated underdog story, allows for moments of real tension and adventure, while presenting a canvas on which one can paint as many interesting and quirky characters as they like. 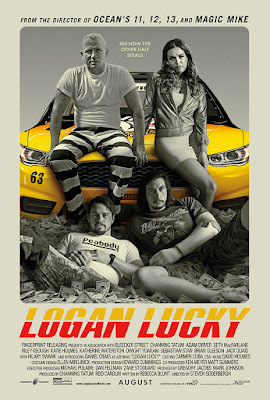 The characters are the real draw of Logan Lucky as one can certainly layer in meaning that concerns the heartland of the American dream and how now, in our present state, that American dream in its purest sense can only be achieved by those who sell out or inherit their daddy's booming business as opposed to those who are willing to chase dreams and work hard, but Soderbergh's film never feels like an attempt to capture something bigger than that of the lark it actually is. It is largely about these people we don't see in big Hollywood productions often enough and upending the assumptions typically associated with them. There is meaning to be drawn if you so desire, but there is also room to just have a lot of fun-which Logan Lucky is. I guess the fact one could seemingly do both only makes the movie more impressive than it already is. Brothers Clyde (Adam Driver) and Jimmy Logan (Channing Tatum) hatch a plan to rob NASCAR in Logan Lucky. We begin by meeting Jimmy Logan who is a good ole boy from West Virginia that likes John Denver and fixes his trucks and teaches his daughter a thing or two about doing so in the process. Jimmy has been down on his luck ever since he blew out his knee playing high school football when it seemed he was destined for the pros. Jimmy works on a construction site down at the Charlotte motor speedway fixing pipes that have burst beneath the track. That is, before he is let-go for not disclosing that aforementioned bum knee on his initial paperwork that the insurance company has now deemed a liability. To make matters worse he is then informed by his ex-wife, Bobbie Jo (Katie Holmes), that she and her new husband Moody (David Denman) and their twin boys along with her and Jimmy's daughter, Sadie (Farrah Mackenzie), will be moving across state lines to North Carolina no doubt making it more difficult on Jimmy to ensure the limited number of days he already has with Sadie actually happen. Having had it up to here with everything the world is throwing at him Jimmy heads to the local bar where his brother, Clyde (Adam Driver), works. Clyde is an Iraq war veteran who lost his arm, I mean hand, in combat and now comes across as something of a gimmick as the "one-armed bartender". It is on this fateful night that a big-wig NASCAR sponsor (Seth MacFarlane) walks into the bar and ends up in a confrontation with Jimmy and his brother that allows for an idea to spark inside what we perceive to be Jimmy's dimly lit brain. Having seen the underground workings of the speedway and how they move the money Jimmy is keen on staging a robbery; one that could do more than settle his debts, but give him peace of mind-which is all he really wants anyway. To do this, Jimmy and Clyde first recruit explosive device expert Joe Bang (Daniel Craig) who is presently incarcerated, but which Jimmy and Clyde have a plan for as well. Once Joe agrees to the scheme things are set in motion with Joe pulling in his two younger brothers, Fish Bang (an unrecognizable Jack Quaid) and Sam Bang (Brian Gleeson), to help out with supplies and transportation as well as Jimmy and Clyde bringing on sister Mellie (Riley Keough) to cover any gaps and provide some necessary motivation. There seemingly couldn't be anything more southern about a heist targeting a NASCAR race, but it is in each of these players that we find something a little more Southern than even the premise of this film. It is in these characters that we find the sweet spot of the movie and what it brings to the conversation outside of being just a solid heist film, but a film that is fun not for what it's about, but because of what the characters bring to their amusing set of circumstances. Cauliflower has high nutritional value and is widely known as one of the healthiest plants on the planet. In Logan Lucky, cauliflower is used as a code word of sorts signaling to Clyde that Jimmy is onto something and desires his involvement. Whether the use of this word is intentional so as to allude to the film itself being more than meets the eye-your guess is as good as mine. One could say cauliflower may look simple enough or be perceived as little more than a knock-off broccoli or cabbage, though it is actually a diverse vegetable in that it can be consumed raw, cooked, or pickled-just the same as Logan Lucky can be taken as a comedy, an ensemble actioner, or a dissection of this Americana state of mind in that the setting, people, and situations give off certain perceptions or ideas of what life is expected to be like when such factors are involved, but like cauliflower, each can be more nutritional than one might initially give them credit for. Of course, Soderbergh or Tatum could have simply thought cauliflower was the right amount of random to throw in at the time and thus it was just that-a random moment of improv that adds to the arbitrary vibes this entire environment gives off, but again-your guess is as good as mine. Either way, in this North Carolina/West Virginia setting there is a sense of upholding this old idea that everything and everyone moves slower in the South. By adapting this kind of preconception and implementing it into the pacing of the film while juxtaposing it with the biggest sport of the region-which just happens to be all about speed-Soderbergh broadly paints a theme of expectations versus reality and then drills in on this in a more granular fashion as the movie goes on. We see Tatum's Jimmy and we feel as if we know the guy. He's a high school star who burned out before he knew he was on fire. We see Driver's Clyde who has provided this great service to our country and is now relegated to serving the people of his country in a different way-one where they can get belligerent, but where Clyde no longer has the right to do what his training would likely inspire him to do. These are people who are easy to make fun of, to look down upon, and would seemingly be an easy target for easy comedy, but Soderbergh (who is from Atlanta, Georgia) is never condescending when it comes to his portrayal of Jimmy or Clyde and as he and his movie continue to drill down into the finer details of who exactly these characters are and the potential they hold we see that, just like that American dream, all is not as it once appeared. Logan Lucky perfectly encapsulates this idea of the underdog by turning those who have already been labeled as hopeless or wastes of time into characters with real credibility. Writing stories-good, significant, entertaining stories-for and about those who have already been written off. 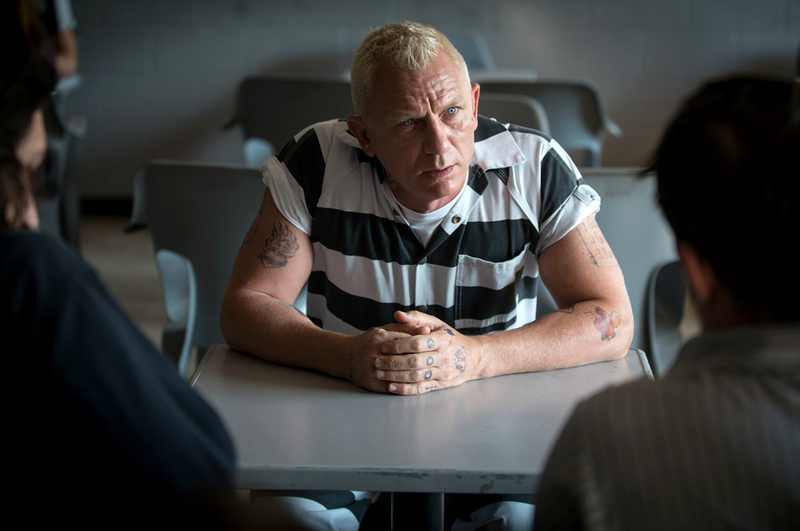 Joe Bang (Daniel Craig) is recruited to help the Logan brothers pull off their heist. Only problem-he's in prison. And while Logan Lucky may largely be considered a comedy caper of sorts it is the fact it gives such characters credence that make it stand apart. Better for the soul, if you will. Still, this is first and foremost a farce and what makes the majority of Logan Lucky so much fun are these characters and the performances everyone brings to the table. This review has gone on without even mentioning the fact Katherine Waterston, Hilary Swank, and Sebastian Stan each get a few moments of their own amongst everything else that is going on in in the film. Though, it is within Stan's role that there is some explaining left to do as I can't figure out if what was omitted concerning his character is meant to be assumed or if there simply isn't anything more than what the movie tells us. The same could be said for Swank who enters the picture so late in the game yet is given what would seemingly be the critical role if there were to ever be a sequel to a movie like this. There is almost no way to clearly decipher what Soderbergh's true intent might have been despite the fact he gives us one of those scheme walk-through's in the same fashion he did in his Ocean's movies that goes through and explains how all the intricate pieces of our protagonist's puzzle of a plan fit together. It is in these untied plot strands that Logan Lucky doesn't come to feel as satisfying as it might otherwise have despite the fact it means to be a little more substantive than it would have anyone know. There are satisfactory conclusions given for each of the parties involved in the heist and the film does well to respond to what might have been lingering questions from audience members around certain aspects of the heist, but there could have certainly been a little more clarification concerning a third act twist as well as a little tightening of the film in general in its last twenty minutes as the denouement goes on about five scenes too long with the high of the heist having long since worn off. For the majority of the running time though, Logan Lucky is a blast and it's clear the people on screen are having fun as well. The characters never laugh at what we, as an audience find humorous, because this is who they are and they are dead serious in their endeavors. The way in which both Tatum and Driver deliver their rather simple dialogue-in this slow, deadpan, but direct fashion-is almost always hilarious no matter what words are coming out of their mouths. It is Craig and Keough who steal the show though, with Craig reveling in the fact he gets to play a character that is such a polar opposite from that of his most popular alter ego while Keough only continues to impress after two very different, but equally layered performances in American Honey and It Comes at Night. Logan Lucky is one of those movies that one could re-visit time and time again because it is enjoyable to simply be in the company of these characters and no matter if that's all the viewer takes away from the experience or if they do indeed find something deeper to latch onto the fact of the matter is Logan Lucky is a good time regardless of if you want to turn your brain off or use it.